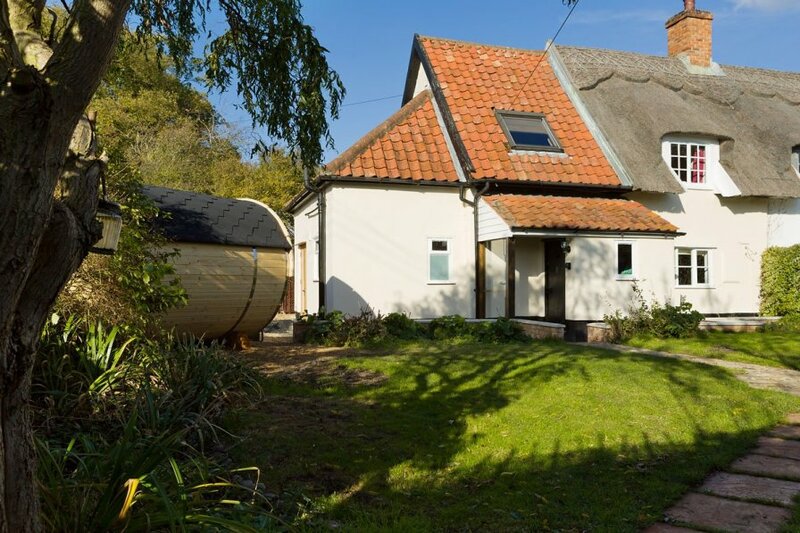 Luxury chocolate box thatched cottage, with private Jacuzzi, sauna, masseur, spa offer: perfect for couples, friends, families, ramblers and cyclists exploring Suffolk and Norfolk. Dogs very welcome. Honeysuckle Cottage is a chocolate box 15th thatched home with large private Jacuzzi and Swedish barrel sauna. It Is perfect for groups of friends, families, couples, cyclists and ramblers exploring Suffolk and Norfolk. A masseur can be booked for Indian head, hot stone or therapeutic massages. Guests also enjoy a day at a nearby country hotel spa with another hot tub, plus steam room, sauna, foot spa and gym for just £10 per person. The cottage is a beautiful Grade II listed home, dating back to the 1400s with large inglenook fireplace and bread oven in the lounge and exposed beams throughout. It has a lovely grass garden and private courtyard garden where there is a 4 seater hottub for your private unlimited use, plus Rattan garden furniture. It can be booked with nearby Owl’s Hoot one bedroom romantic barn, and Oak Cottage, a two bedroom cottage, both in the village and also listed, if you want more accommodation. All three properties are located in the village of Stoke Ash, near Eye, with all necessary amenities within easy reach. Spacious lounge: Large Smart TV, leather sofa and chairs. Contemporary stunning electric fireplave with multiple flame, light and heat settings. Kitchen Area: Range style cooker with gas hob and oven, microwave, fridge / freezer, dishwasher, washing machine and tumble dryer, toaster, kettle, all utensils and cooking equipment. Dining room: Dining table and chairs, sideboard, both solid oak. Bedroom: King size bed, oak wardrobe, oak chest of drawers, oak bedside tables, oak dressing table, lamps. Ensuite with roll top bath, toilet and sink. Bedroom: Double bed, which can be turned into two single beds on request, an oak chest of drawers, oak bedside tables, lamps. Bathroom: Large double shower with powerful electric shower, washbasin and toilet. Electric shaver point. Large mirror and cabinet. Garden: Lawn, pretty courtyard garden with private 4 setter jacuzzi and rattan garden furniture.. Parking: Two off road car parking spaces. Heating: Modern electric panel heating throughout and a large contemporary electric fire. Notes: Wi-Fi and towels provided. Please note this is a village and WiFi speeds are not as fast as in towns or cities. This is a peaceful village and we please ask you to be respectful of our neighbours ensure they are not disturbed by noise between 10.30pm and 7am.